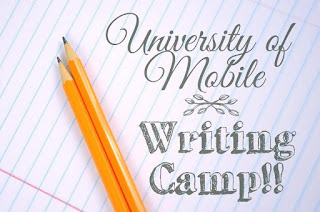 ~The University of Mobile has some pretty big things coming down the road for us homeschoolers! We recently announced a 3 day summer writing workshop collaboration! The Summer SAH-UM Writing Camp (May 23-25) will be entitled: "Reason, Rhetoric, and Writing: Developing, Defining, and Defending Arguments." Dr. Mashburn and Dr. Schuler will use classic literature to teach critical thinking--expressed through writing. The workshop will be $100 for all three days and that I will begin taking payments in mid April!This one is not to be missed. PLEASE join us on Facebook at SAH University of Mobile Homeschooling Alliance https://www.facebook.com/groups/1023500957707419/ so you don't miss out!